In this lab you will use almost every routing protocol Cisco offers for TCP/IP and should take even advanced engineers several hours. Good Luck. -Use a 28 bit mask on all Frame Relay Interfaces. – Redistribute RIP into OSPF and OSPF into RIP, on R3. 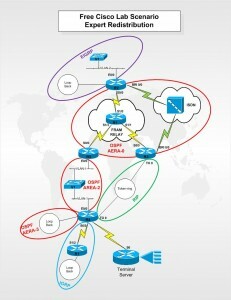 – Redistribute EIGRP into OSPF into EIGRP on R2. Make sure that all interfaces are still accessable in the event that VLAN1 fails. – Redistribute the BGP routes so that all routers can ping the loopback addresses on the Term_Srv. – Filter the advertisement of the 10.1.1.0 network. – Advertise a summary route only for the 170.10.x.x network to the Term_Serv but do not allow this summary to appear in the routing tables of other routers. – Do not advertise the 192.19.15.0 network. This route should not appear in any routing table except R4’s. When you are done you should be able to ping every interface on the network from any router, even if VLAN1 is down.